(Package of 12) Split rings included with tags. 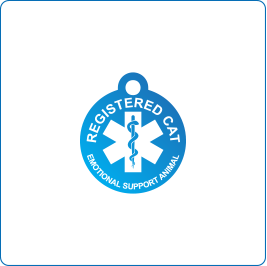 Registered Cat Tags are made to order. Allow at least two weeks for delivery. Disclaimer: Emotional Support Animals are covered by the American Disabilities Act (ADA) as stated by the United States Department of Justice Civil Rights Division. iMARC Registered Cat Tags does not in any way certify your cat as a Emotional Support Animal. Misrepresenting an Emotional Support Animal may result in stiff fines, and penalties. For more information about Emotional Support Animals & the rules, and laws surrounding them please check your local state regulations.